Bloomsbury USA Childrens, 9780802797544, 32pp. During Hurricane Katrina, evacuating New Orleans residents were forced to leave their pets behind. Bobbi the dog was initially chained to keep her safe, but after her owners failed to return, she had to break free. 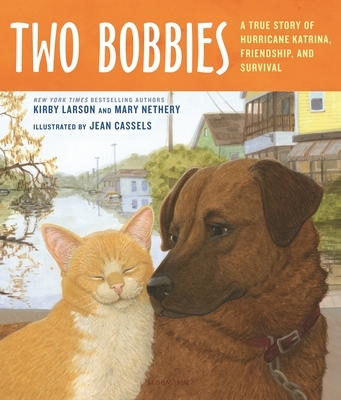 For months, Bobbi wandered the city's ravaged streets-dragging her chain behind her-followed by her feline companion, Bob Cat. After months of hunger and struggle, the Two Bobbies were finally rescued by a construction worker helping to rebuild the city. When he brought them to a shelter, volunteers made an amazing discovery about the devoted friends-Bob Cat was actually blind! He had survived the aftermath of the storm by following the sound Bobbi's chain made as she dragged it along the ground. At the shelter, the two bob-tailed friends refused to be parted, even for a moment. Could rescue workers find the Bobbies' owners? Or could they find a new home that would take them together? Jean Cassels has illustrated more than fifty natural history books for children. She is the illustrator of Cats to the Rescue. She lives in New Orleans, Louisiana.